Get the story from the (nine) horses' mouths. Roberts wrote the opinion. Scalia wrote the dissent. 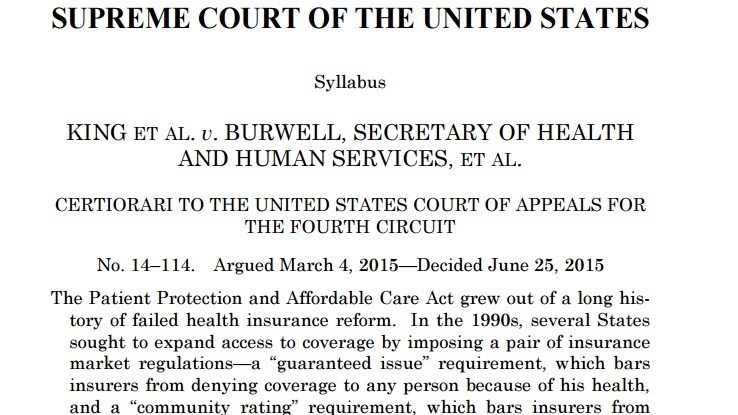 The new U.S. Supreme Court ruling on King v. Burwell (Case Number 14-114) is more than a landmark decision affecting the future implementation of the Patient Protection and Affordable Care Act (PPACA). It’s a chance to read 26 pages of legal writing from Chief Justice John Roberts, who wrote the opinion for the six-member majority, and 21 pages from Justice Antonin Scalia, who wrote a dissent that was joined by Samuel Alito and Clarence Thomas. Roberts justifies going beyond what some might believe to be the plain meaning of the text of the law. Scalia finds fault with the majority’s approach to reading PPACA. “The court forgets that it is no more appropriate to consider one of a statute’s purposes in isolation than it is to consider one of its words that way,” Scalia writes. To read their words for yourself, with some interesting parts highlighted, click here.